Delivering a team project can become a difficult task if the whole team is not on the same page. Developing a plan to keep the whole team on the same page can alleviate confusion and disunity in the team. As a more unified whole, the team then is more efficient in getting the work done right and on time. The use of a project team communication plan template can help guide you and your team towards a workable plan not only for this single project but for subsequent projects. First, download and save the template. Then add the official title of the project you are working on. Save again to keep versions straight. Second, start inputting the details of events, responsibility, frequency, and audience line by line. Save frequently so that little of your plan is lost in the event of a computer crash. Third, as each section of the project is complete, live by the plan. Make sure that is delivered to all of the appropriate members so that everyone knows it and abides by it. First, remember to review the Project Team Communication Plan spreadsheet in Excel from time to time. As the project changes so may also the communication needs of the team. Adjust as necessary. Make sure the revised communication plan is delivered to all team members. Second, remember again to review your communication plan if the team changes as well as over timeline of the project. Make sure that new members receive a copy of the communication plan as soon as they join the team. Be sure to add a section for details that can help them get up to speed on the project as quickly as possible. Third, this template is primarily designed for the workplace. However, this gathering of communication plans works well for long term school projects as well as volunteer work. In such uses, be sure to keep the copies separate for obvious reasons. Team projects require communication. Communication requires planning. 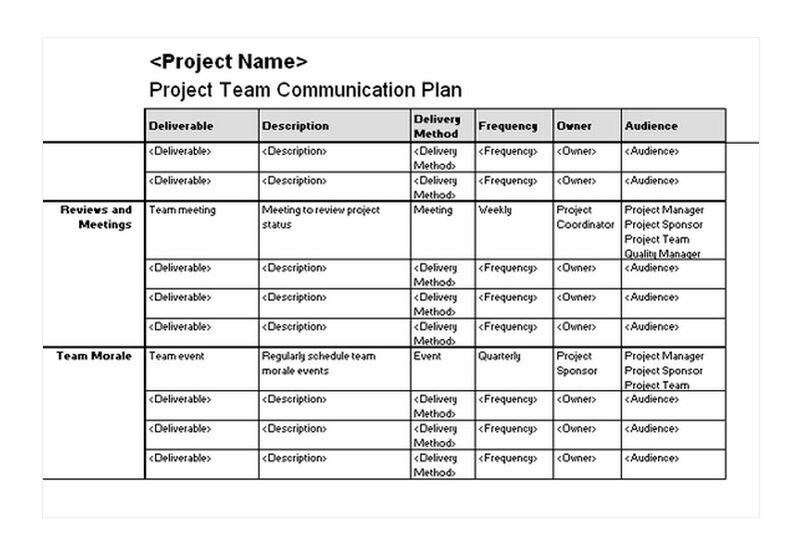 Using a Project Team Communication Plan template can help you fulfill both of those requirements easily. You can then accomplish the best project for your client or teacher.